Having been diagnosed with scoliosis as a teenager, Dr. Long is very familiar with scoliosis (abnormal lateral curvature of the spine) and its effects on the body. If younger scoliosis patients are treated before their growth spurt, chiropractic can help diminish the abnormal curve and assist the spine in growing as straight as possible! 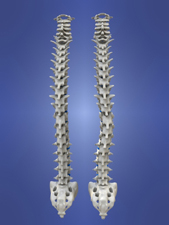 I came to Dr. Long with a long list of issues… scoliosis, chronic headaches, anxiety, etc. She was quickly able to come up with a holistic approach to treatment. She treats me as a whole person and not individual ailments. Through chiropractic, adjustments, massage, acupuncture, dietary changes and vitamin supplements I’ve seen great improvements in my physical, mental and emotional well-being. The entire staff at West U Wellness is friendly, extremely knowledgeable and truly wants to help me get and stay healthy. I look forward to every appointment because I know I will leave feeling better. I've been seeing Dr. Long and Dr. Yeager for years now. When I started, I came in for adjustments to keep my back pain under control. I had 2 major back surgeries when I wase a child/teen for scoliosis. I continued having back issues after my second surgery. Chiropractic was the only way I could function. If I didn't get regular adjustments (at least every 2 weeks), I'd have a lot more pain and discomfort. Around 2012 I started having a strange foot pain in my left foot. I didn't know if I injured it or if it was a nerve issue. I had steroid injections, surgery, PT and prescription medicine to try to treat it and nothing seemed to help it for any period of time. I asked Dr. Long if we could try acupuncture. This is when I was able to see both Dr. Long and Dr. Yeager. Within just a couple of acupuncture treatments, my foot started feeling better. I started to come in weekly for chiropractic for my back & neck as well as acupuncture for my foot. Coming weekly just made me feel so much better! About a year later I had some pretty major medical issues. I found continuing chiropractic really seemed to help me get through all of it so much easier. It has been a struggle dealing with all of these changes, but I can't even imagine what it would have been like if I hadn't continued chiropractic and acupuncture. Now I'm starting to feel much better and I would absolutely recommend chiropractic care and acupuncture!